We don’t have a television here. That is something that boggles the mind of several family members and is something my children have put on a list to give to CPS when we’re finally investigated. However, we have a computer and internet and access to YouTube. Via YouTube I have been introduced to a number of wonderful shows. One of which is The Great British Bake Off (all 5 seasons). The contestants on The Great British Bake Off (or The GBBO as the kids have hashtagged it, because I’m sure it’s popular with the teens) … anyway, the contestants on The GBBO have 3 challenges that go along with that week’s theme: 1) The signature bake where they bake something of their choosing; 2) A technical bake where they have to make a really fiddly recipe with a minimum of instructions; and 3) A “show stopper,” which is a really elegant and extreme bake of their choosing. 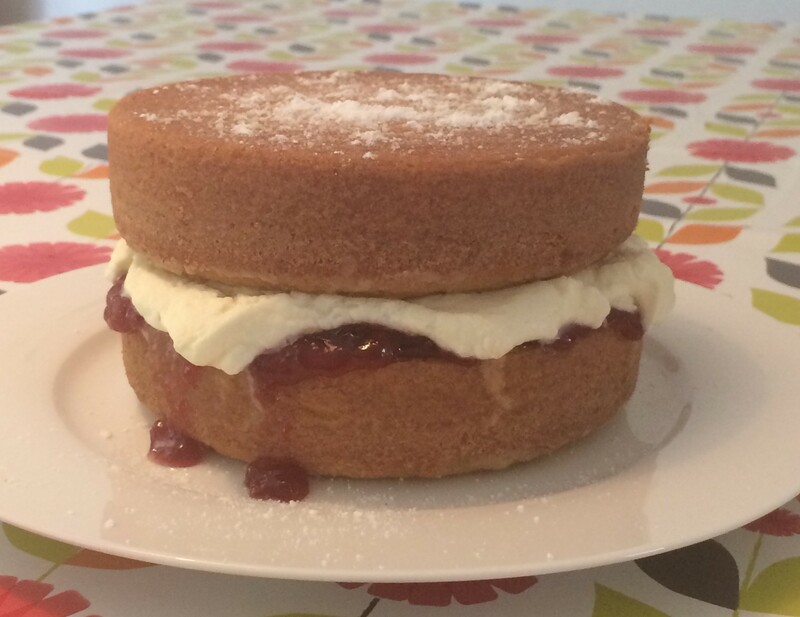 Here is the episode featuring the Victoria Sandwich Cake. To find a recipe I went to my stand-by cookbook for good British baking, Vintage Cakes, by Jane Brocket. My dear friend, Kate, gave this book to me and when I use it I feel like she and I are having a chat. And that, my friends, is the magic of cooking. You might know Jane Brocket from her blog Yarn Storm and her book The Gentle Art of Domesticity. She is from Berkshire, England and has rediscovered and/or preserved the arts that once upon a time every housewife knew like the back of her hand. Her book has a recipe for a Victoria sandwich cake that I’d never tried before, but it seemed very straightforward. I cannot publish the recipe here, however, if you Google “Victoria Sandwich Cake” you will see some recipes that are very, very similar. In fact, here is Mary Berry’s (the queen of all British pastry) recipe for the Victoria Sandwich that the bakers on The GBBO had to make. The key to the whole kit-and-caboodle is to gently fold in the self-rising flour and baking powder after whipping together the butter, sugar, and eggs. Also! If the batter doesn’t seem creamy enough you can add a tablespoon or two of milk. A word of caution: Do NOT open the door to check on them. They will fall and you will end up with craters instead of cakes. If you took the time to watch the episode of The GBBO, you will see that people had various troubles with baking times and with the density of their cakes. The powdered sugar on the top looks like it was dumped on my hand because it was. My little sieve was in the dishwasher when I needed it and you can’t just tell the kids, “I’m sorry. You can’t have any cake yet because mommy needs to wait for the sieve to be done so I can elegantly shake powdered sugar over the top for presentation.” I’m sure that would be yet another item on that list for CPS. The overall verdict was DELICIOUS! Both the kids loved it and Mark had two whole slices! It was light and just a little sweet. Really perfect for a summer picnic. I could see it being a good substitute for a strawberry shortcake if you needed something a little swankier. About a week later we were having company up for cocktails and I made these as cupcakes. I had the brilliant idea to put the jam in the middle of the batter so it would bake right in and be a lovely surprise for the kids. I had also planned to top it with whipped cream. I buttered the tins so I would have smooth sides just like the larger cake. To get the jam inside I filled the cups about 1/3 of the way full, put in a scant teaspoon of jam, and then topped it with the rest of the batter. I baked it for 20 minutes and pulled them out to cool. When I flipped it over to dump them out I got a nasty surprise. They came right out of the tins … without their bottoms. The jam magically sunk down to the very bottom of the cake and stuck to the tin. I got all the cupcakes out and they looked great, but I couldn’t sit them up the correct way or they would get stuck to the plate! So I served them upside down. I scraped the jam out of the bottom of each tin and put it on the now top of the cake and then hid the disaster with copious amounts of whipped cream. They were absolutely delicious and the children begged for more. Thereby proving that my mother is always right. There isn’t anything that you can’t make better with jam and whipped cream.